Huevos a la Mexicana are a breakfast staple in Mexico. Onion, tomato, and a the irresistible heat of serrano or jalapeno pepper lift scrambled eggs to a whole new level! Everything comes together quickly and is ready to serve in under 30 minutes. This meat-free meal can also be enjoyed beyond breakfast. It would be a great choice to serve on Meatless Monday as well! Don't forget to garnish with a hearty handful of fresh cilantro before serving. It is the final flourish that makes the dish extra special. 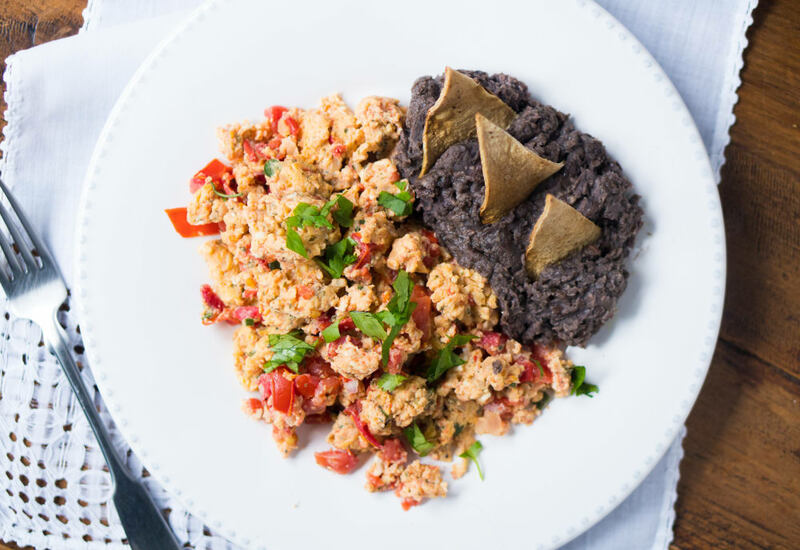 Traditional side dishes for for these eggs include refried beans and warm tortillas. Feel free to add sliced avocado or even a dollop of guacamole to jazz things up a bit! Per Serving: 406 calories; 24g fat; 27.8g carbohydrates; 22g protein; 372mg cholesterol; 430mg sodium. These Mexican eggs and beans are amazing! They are so delicious, and go perfectly with salsa verde. This recipe will definitely take your breakfast game to a new level. These Mexican eggs are incredible. It will be hard for me to eat plain eggs again after this. Also really good served with black beans. Nice, hearty breakfast.